The ancient Greeks are a fascinating people to study because they were so advanced for their time. They had fully functioning cities with far more conveniences than you would expect for an ancient civilization. They flourished BEYOND necessity into BEAUTY. Their architecture, art, and even everyday items were not only functional, but beautiful and reflective of their values. We have been enjoying their exquisite designs ever since. Urns were very common within Greek culture. They were used to store food, water, and wine in. Urns held things like cosmetics, perfumes, and spices. They were used to transport things in too. Any old pot would serve these functions. If you think about it, we use plastic pitchers, tupperware, and cloth or plastic cosmetic pouches. We rarely use anything as fancy as an urn for these purposes. But the Greeks weren’t just holding things; they were making beautiful works of art that were also useful. They incorporated geometric lines and designs, and often had a scene of importance center stage on the urn as well. The urns told stories. Kids can tell their own stories on 2-dimensional urns. After looking at several ancient Greek urns, let them sketch their own urn design on a piece of colored construction paper. My son made something he values right in the center of his urn – snow skiing! They cut out the outline and glue it on to a darker piece of construction paper. Then they use a ruler to draw straight lines across the urn and varying intervals. Leave a larger space in the center where the scene will go. I asked the kids to fill their smaller lines with some sort of geometric pattern to represent the order the Greeks valued within art. Then on the larger space I suggested that they draw something they valued or something that was very important to them. 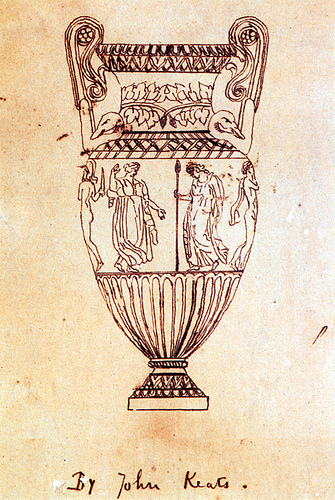 The order and geometry, along with the basic form are representative of the Greeks, but the focal point of the urn is representative of the artist. 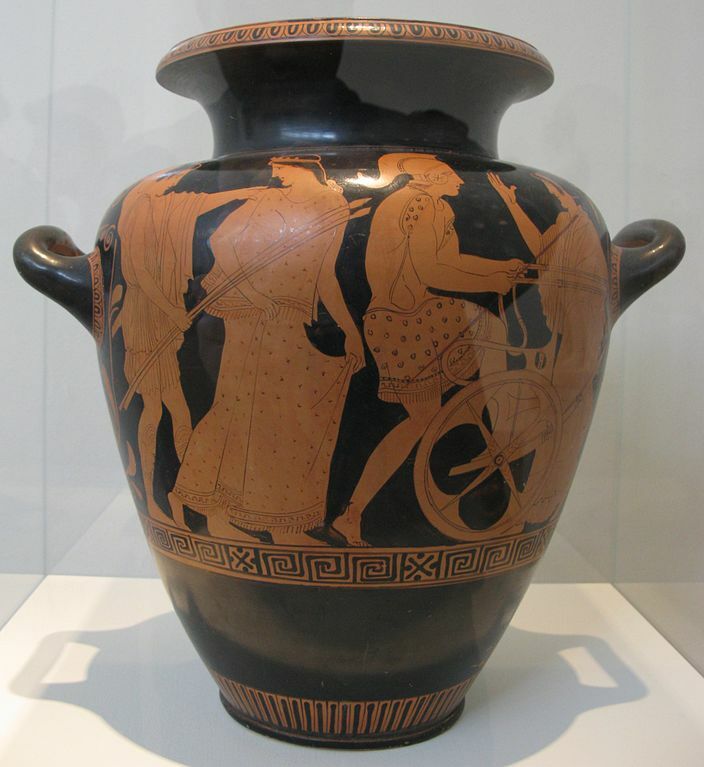 For older students, Keats’ Ode on a Grecian Urn is a fascinating and detailed look at one particular piece of artwork that Keats examined at length. He imagined and played out the stories he saw pictured there. It is a close examination of art. Is beauty truth? Looking at art principles along with doing an art project is time well-spent. Examine various pictures of urns (including the student produced ones) and look for these elements: line, shape, pattern, balance. Look at examples of Greek pottery over time. The shapes of the pots themselves changed and evolved. Contact someone with a pottery wheel in your town (often universities or private pottery shops offer classes or workshops) and learn to throw pots. You’ll have a whole new appreciation for just how difficult an art this really is. Sculpt two basic pots or bowls out of clay. On one, use a toothpick to carve out your design. Leave the other pot smooth. Bake both pots to harden them. Once they are dry and cool, paint the pot that was left smooth. These were the two styles of decoration the Greeks used–carving (or inscription) and painting. Here’s a printable project that teaches about ancient Greek philisophers. However (here is an overarching thought to consider), since the predominant philosopher for all of the Romantics, from Blake to Yeats, was Plato, the culminating line of Yeats famous poem makes beautiful sense. Because, you see, Plato believed that the eternal verities (or principles) such as the ideals of Beauty, Goodness, and truth were not of this world — but rather of a timeless, spaceless realm of pure ideas.